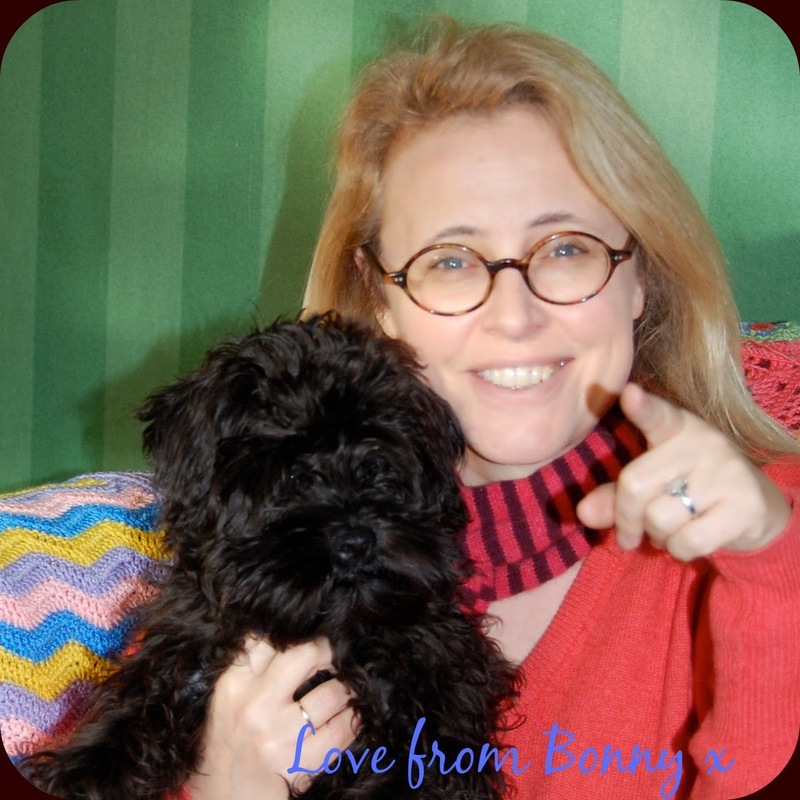 I'm showing all the symptoms of having developed an obsessive compulsive disorder with knitting Fairisle. I've always been a lover of bright, vibrant colours and this technique really plays to that passion. It embraces colour: the bolder the better. Now I like to have something to celebrate. I've moaned a lot about what a miserable month January is on the basis - amongst others - that it doesn't have the decency to throw up one good excuse for a party. So, by the time I get to February, I'm really looking forward to all the fun and nonsense that is St. Valentine's Day. Go on: embrace your inner girl and go pink! I've got grand plans for a cluster of these little cushions in contrasting candy colours, which should look good scattered on the white bed linen of a guest bedroom. I had a couple of cushion pads that were looking rather tired in their current garb so I decided to use one of those. It measured 44 cm x 33 cm or 17"x 13" if you prefer Imperial, and I designed my cover to fit. I think it's a standard-size rectangular cushion over here in the UK. I chose Peter Pan merino baby which is a lovely soft squidgy wool that comes in a pleasing selection of candy colours. I chose this dusty pink (colour code 3036) as my main colour with a cream contrast (colour code 3031). This wool knits on 4 mm/ US size 6 needles. 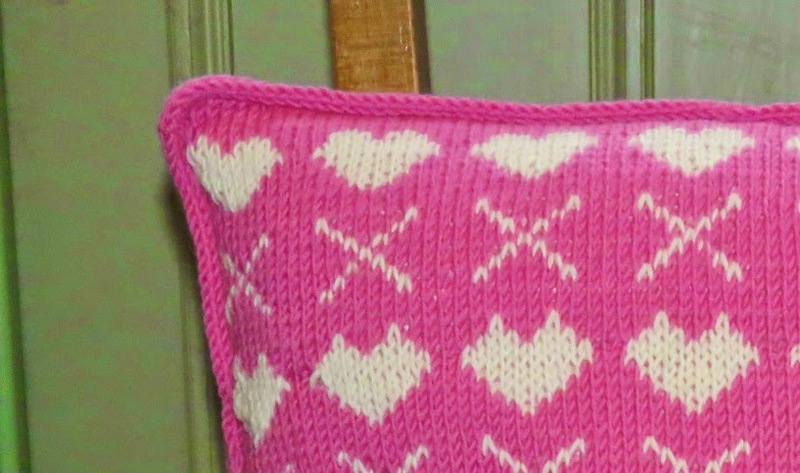 The pattern is worked in stocking stitch, which is alternating rows of knit and purl going back and forth for each row. 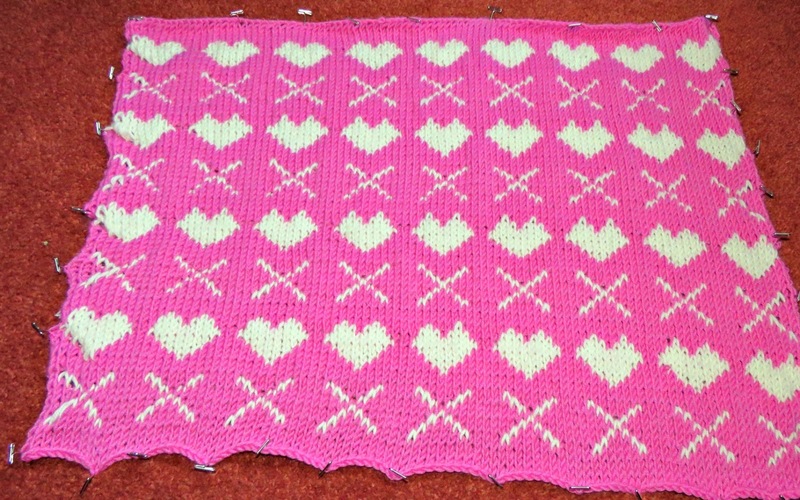 Cast on 99 stitches in your main colour (pink in my case) and work two rows in stocking stitch. If you would like to make a larger or smaller cushion you can increase or decrease by adding or subtracting stitches in multiples of 11. I've designed my pattern to work over 11 stitches and 20 rows. 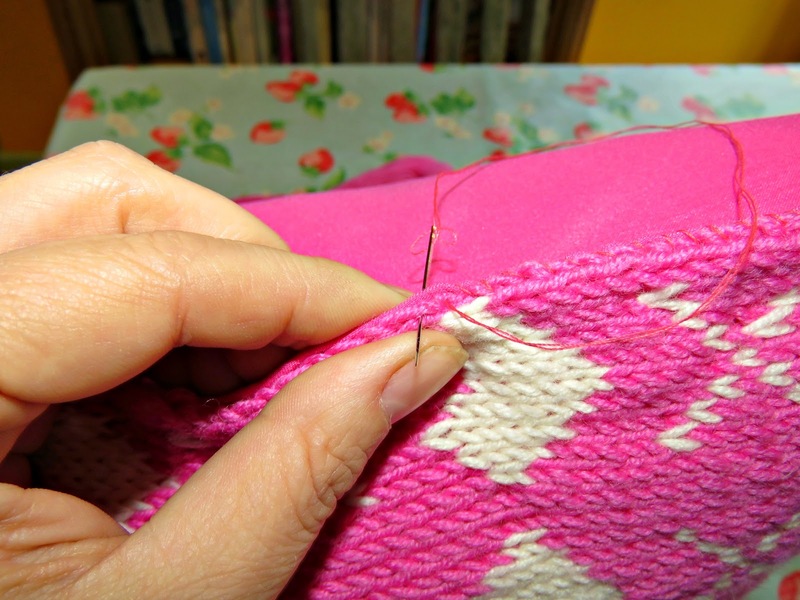 You may also like to use circular needles, but work them straight. I always prefer to work with circulars when I can as they're much more portable and place less stress on your wrists if you're working with a heavy fabric. Now you need to follow my graph for the patterned rows that follow, repeating each group of 11 stitches across your row until you reach the end. You will have 9 hearts in total working across. 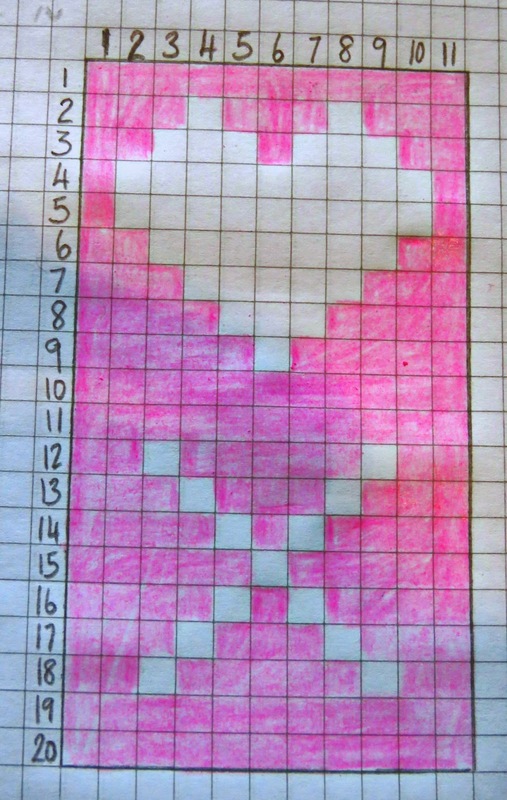 Each square is one stitch, and you change colour as shown by the colour of the squares. 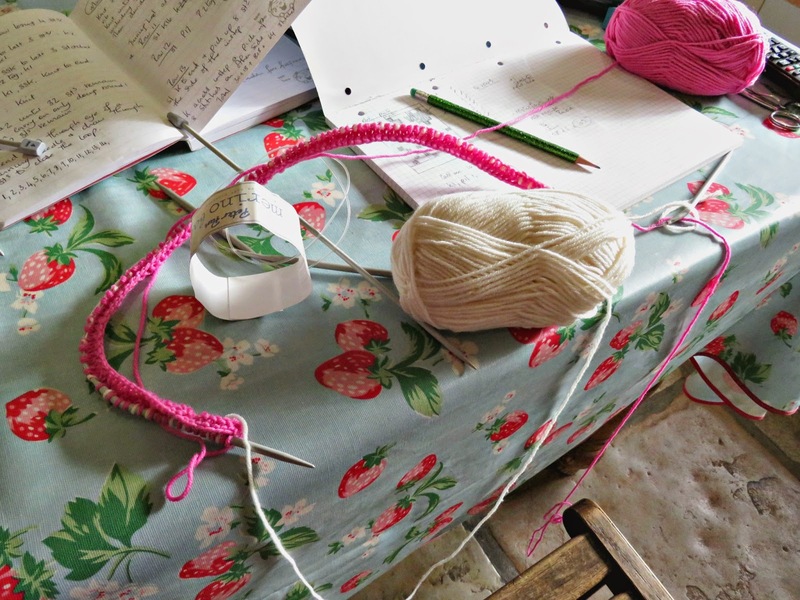 Please remember when you work a purl row that you have to follow the graph from right to left. Keep going until your work is almost 33 cm long. I worked 4 sets of hearts and kisses to get to the bottom of my cushion, and then I finished off with 2 rows of stocking stitch i.e. 1 row of knit and 1 of purl. Then cast off. When you're done it's really important to block the knitting to straighten it out and get it to the exact dimensions of your cushion. I pinned mine to the dining room carpet with blocking pins (long pins with bar ends - you can buy them on Amazon). Using a tape measure check and double check that you've got it the right length and width. You really don't want to pull it out of shape at this stage. Then take a steam iron, and holding it really, really close to the surface of the cushion but without actually touching it, press the steam button and infuse the yarn with steam. I like to use fragrant ironing water for this as it adds to the sensory experience. 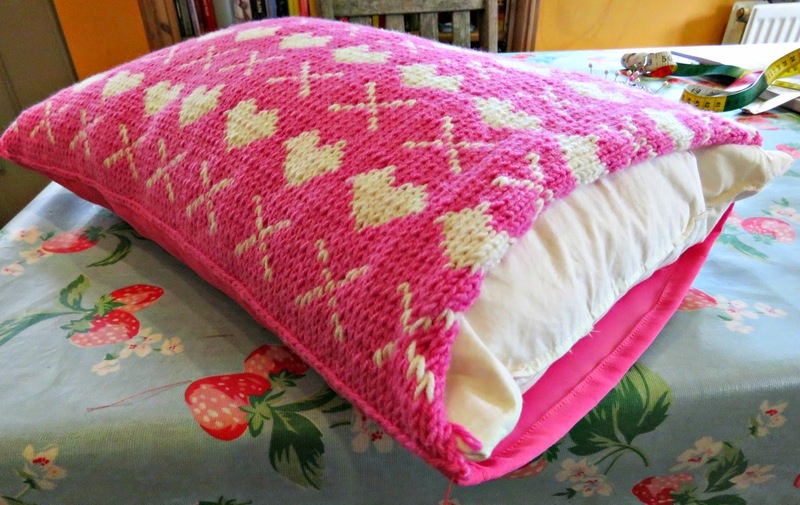 Now just leave your cushion in place until it's dried out - overnight ought to do the trick. When you unpick your creation it will have magically conformed to the shape in which it was pinned giving you something that's much easier to work with. You could knit a back to match in the same pattern or in plain stocking stitch, but I chose to back my knitted front panel with some jersey crepe that I found in the same candy pink. I'd originally headed out to my local fabric store thinking hopeful thoughts of a lovely, plush short-pile velvet in that wonderful tone, but there was none to hand so I compromised on the jersey crepe rather than spend a week searching all the shops for the exact thing that I had in mind. Life's just too short. In any event I like the contrast in texture when you back a knitted panel with another fabric. I cut the crepe to the size of the cushion allowing a 2.5 cm seam allowance all the way round (i.e. I cut a rectangle of 49 cm x 38 cm along one selvage of the cloth to keep me straight and to make sure that the stretchiest part of the cloth ran the depth of the cushion), and then sewed it into a rectangle, killing the raw edges with a double seam all the way round. Keep checking with your measuring tape each time you pin and tack a seam to make sure that you've not pulled it out of shape, and that it measures the correct finishing size (44 cm x 33 cm in my case). When you've sewn the backing to the correct size you need to stitch it to the knitted panel (wrong side to wrong side) with an over-locking stitch that allows a little bit of movement as between the two. Jersey was a good choice of backing as it's quite stretchy, but if you're working with something stiffer you will want to use lots of small overlocking stitches that allow for a little movement. 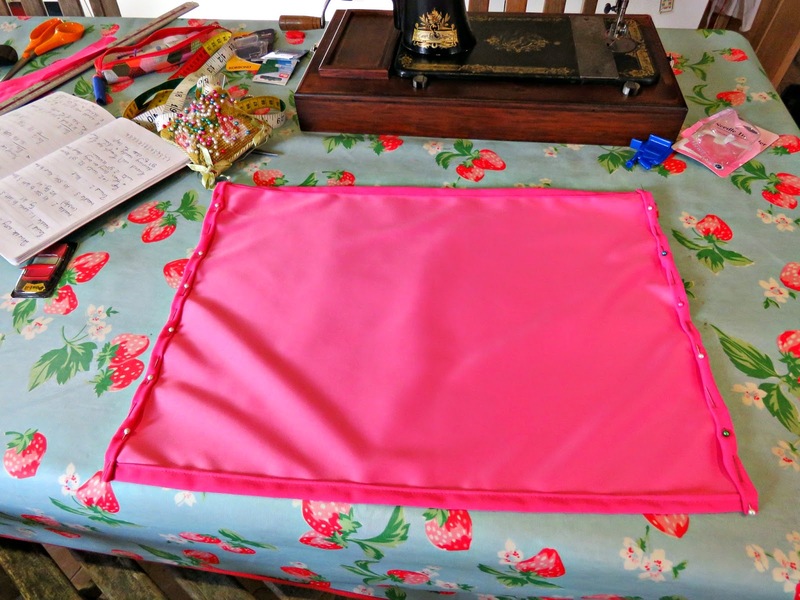 When you've got 3 sides done, slide your cushion inside the envelope and sew up the remaining side. By the time I'd got it all sewn together it was starting to look quite good. I reckoned that I could have left it like that and it would have been fine. Moreover if you leave it like this without any further embellishment you really get to appreciate the contrast in textures between the front and the back. But I decided that I'd knock up a quick i-cord trim to go all the way around the edges of the cushion. 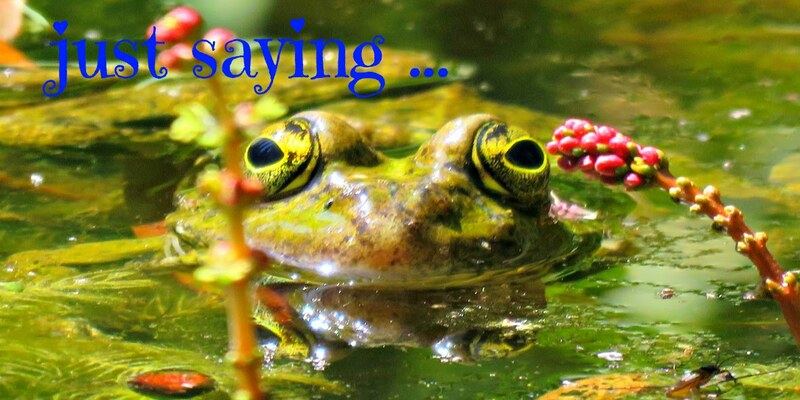 If you'd like to do one it's the easiest thing in the world to make. Cast on 3 stitches, and knit one row. When you've got to the end of the row, don't turn your work around. Push the stitches back to the top of the needle they're on and start knitting the next row using the live end of the yarn, which will be at the wrong end of the row. You simply pull it across each row and it closes the fabric to create a tube. And you keep knitting and sliding the stitches and then knitting the next row without ever turning your work until you've got the length of trim that you need. I've knit this row, pushed the stiches back up the active end of the needle and pulled the live end of the yarn across the back of the row to knit the next row WITHOUT turning the work around. When you've got it the right length just sew it around the edge of the cushion, sewing the two ends of the trim neatly in place. Start and finish sewing the trim at one of the bottom corners of the cushion, so that the join is not going to be noticeable when the cushion is sitting upright. I also didn't cast off until I'd almost attached all of the trim so that I could rip it back a bit to get the perfect length. It's a bit fiddly as the i-cord is very stretchy which makes calculating how much you're going to need a bit tricky. As a result it's best not to cast off until you've got most of it sewn in place and can see exactly what you need to finish. And bingo! Hearts and kisses: you're all set for Valentines Day!